Any time I can make a complete meal in thirty minutes that’s a good day. A delicious meat sauce doesn’t have to take all day, or a whole bunch of ingredients. I used to make one that took three hours but not any more. My new recipe uses simple, basic ingredients that everyone can get, or might already have. All you need is canned tomatoes, lean ground beef, onions, garlic, and tomato paste and you’re on your way. This recipe is so easy, you’ll even have time to make a salad and cook the spaghetti, all in thirty minutes or less. “Why don’t you make more videos?” That’s what they say but here’s the problem. I’m retired! I should be lounging along an exotic beach somewhere sipping something in a tall glass with a little umbrella on it. 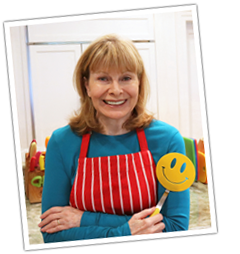 Instead I’m in the kitchen and that’s because… well, I’d rather be in the kitchen than Cabo! Call me crazy but they always said do what you love. And I’m doing it. So here is another video. It’s my dark chocolate fudge brownies and I’m pretty proud of myself for this easy recipe. You’ll see that by using foil and wax paper, you only have to wash one pot. And it’s another super easy, healthier than most, recipe and again I’m baking without butter. I finally made another video! I had to show how easy this cake recipe is and how simple the ingredients are. With no butter or eggs, you likely have everything you need right now to make it. Flour, sugar, and cocoa are the main ingredients with some baking soda, oil, lemon juice, and vanilla. That’s it. Even if you don’t bake much, it’s hard to mess this up. You don’t need a mixer but I do recommend using Dutch process cocoa (I use it for all my chocolate baking). It’s darker but it’s less bitter than the regular stuff. I find it (Droste brand) at my grocery store and also at World Market. That’s why this cake it so dark and rich looking. Wait ‘til you see how easy it is to make your own homemade whole wheat bread, from scratch, in 90 minutes. This is a delicious, soft loaf that I use for things like sandwiches, French toast, and bread crumbs. It makes fantastic soft bread crumbs like I use in my salmon patties and you can use it to make healthy dry crumbs, the ones I use in my chicken parmesan. Apple pie doesn’t have to be full of butter and shortening to be awesome. My healthier apple pie uses an easy oil crust and I use extra-light olive oil for that. And the filling! OMG, it’s so good!! I use three pounds of granny smith apples with a deep dish pie pan. Homemade apple pie is something special and I hope my video shows that it’s not hard to make, especially with an oil crust. I used to make pie crusts with shortening and ice water, etc. so forget that method. It’s too much trouble. An oil crust is healthier, way easier, and bakes up beautifully. One of the healthiest recipes I make is my salmon patties. Now here’s a how-to video that shows just how easy it is to make a meal that benefits your heart, brain, eyes, joints, even your skin and hair, not to mention the cancer protection provided by salmon. And canned salmon makes this a healthy dinner you can make any time without a trip to the fish market. The patties come together very quickly with just a few ingredients so the whole process, start-to-finish, takes less than 15 minutes. This is the only think I deep fry… but I don’t care. Chrusciki are too good not to have at Christmas time and there is no way to make them without frying. And there is no way to eat just one. These dainty powdered sugar delights, which are also called angel wings, also called bow ties, also called faworki, etc., are absolutely delicious thanks to the delicate flavor of vanilla and fresh citrus peel. As dramatic as they look, they are easier to make than you think. I learned from my mother who made them every Christmas. She rolled the dough and my sister and I shaped them into knots or bow ties. She made a whole bunch at one time but I find it more manageable to work with a smaller dough and take up less counter space. Besides, if I made more I would just eat more. I’ve never seen anyone eat just one. So here is my how-to video. I tried to keep it simple so even inexperienced cooks can make these fabulous holiday cookies. The most important thing is to roll the dough super thin so be patient. It takes me two minutes to get it thin enough and I’ve been making them for years. You roll half the dough at a time and it needs to be at least 12 by 12 inches or 14 by 10 or 16 by 8, etc.. The shape doesn’t matter as long as you have around 140 square inches. You should be able to almost see through the dough. You’re about to be surprised at how easy it is to make homemade pumpkin pie from scratch…. a really good pumpkin pie, too. Did I mention that mine is healthier since it has no butter or cream anywhere and the crust is made with olive oil? And it’s delicious! The filling is so simple with only four ingredients plus the spices. I use canned pumpkin and canned milk. Where other recipes use cream or condensed milk, I use 2% reduced fat condensed milk. And if you’re considering using fresh pumpkin you should know that canned pumpkin has more vitamin A than fresh and all you have to do is open a can. I’m all about using fresh ingredients but not with pumpkin. Have you ever tried to cut one up for cooking? If you accomplish that, you can skip the gym that day. I’ve struggled for years with pie crusts, trying to avoid shortening but butter was the only replacement and I didn’t want all that saturated fat. Then I discovered oil pie crusts. They are so easy, so quick, and hard to mess up. This is a healthier pie crust because I use heart-healthy extra light olive oil and it could not be an easier. It’s the same crust I use in my apple pie, chicken pot pie, and apple pie bars. It’s the only crust I ever use. When a pumpkin pie comes out of the oven, the smell of those wonderful spices is intoxicating. 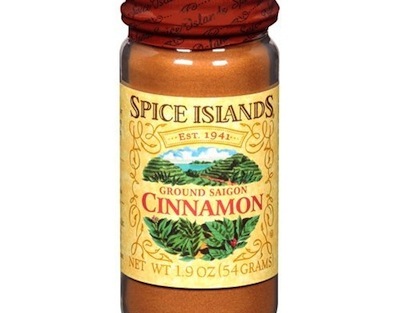 I use cinnamon, ginger, nutmeg, and cloves but I prefer Saigon cinnamon over the more common Ceylon cinnamon. 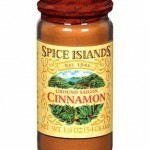 The difference in flavor is huge so if you can find Saigon cinnamon (my brand is Spice Islands), it is a more fragrant and potent cinnamon. I used to think it took hours to make a great spaghetti and meatball dinner. Here’s my video to show that is not the case. You can make an absolutely delicious sauce (it’s my quick & easy spaghetti sauce) AND the meatballs AND the spaghetti in about half an hour… AND still have time to make a salad. Spaghetti & meatballs pleases just about everyone but doesn’t all Italian food? My goal with this quick and easy meal was to make a great marinara sauce, which means you must use fresh basil. Basil is just about the best smelling herb there is and it’s key to a great sauce. I also wanted super soft and healthy meatballs and mine are just that. I use the leanest ground beef I can find and fresh bread crumbs that soak in milk. I use my own homemade whole wheat bread for the crumbs because it’s a soft loaf so look for a soft whole wheat bread or you can use white. But of course, whole wheat will add some beneficial fiber. Cooking the meatballs in the sauce makes them even more flavorful as they absorb the sauce and become super moist and delicious. So here’s the drill: While the sauce cooks you make the meatballs. While the meatballs cook you boil the spaghetti. While the spaghetti cooks you make a salad and set the table. And if you want this meal to go into overdrive, how about my simple garlic bread to serve on the side. Calling all bread people!! You can make the most amazing crusty rolls at home and it’s easier than you ever imagined. There is no kneading. There is almost no work. The hardest thing is to stop eating these delicious rolls, especially when they’re fresh and hot out of the oven. Everyone loves no knead bread that bakes in a Dutch oven like magic and comes out with a beautiful golden crust. But if you don’t have a Dutch oven (and they are expensive) you can make no knead crusty rolls instead and all you need is a baking pan. No knead bread usually requires that you start the dough the night before, using cold water, and let it rest overnight. With my hot water method, you can make the rolls the same day so it’s faster and any time I can make bread faster, I’m a happy baker. These are the best rolls I’ve ever had.